Partisanship and ideology are major factors in attitudes about foreign policy and U.S. global engagement. But both the Republican-oriented and Democratic-leaning coalitions are internally divided in opinions about America’s global role and U.S. economic engagement. More Americans say it is best for the U.S. to be active globally than did so in 2014 (35%), with the shift coming almost entirely among Democrats and Democratic-leaning independents. Yet while large majorities of Solid Liberals (87%) and Opportunity Democrats (76%) express positive opinions of U.S. global engagement, this view is not widely shared among Disaffected Democrats and Devout and Diverse, who are less affluent and have lower levels of education than do Solid Liberals and Opportunity Democrats. 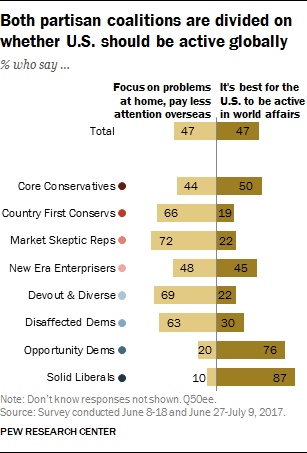 Just 30% of Disaffected Democrats and 22% of Devout and Diverse say it’s best for the U.S. to be active internationally; majorities in both groups (63% of Disaffected Democrats, 69% of Devout and Diverse) say the nation should pay less attention to problems overseas. The Republican-leaning typology groups also are divided over U.S. global activism. Half of Core Conservatives – who are better educated and more affluent than other GOP groups – say the U.S. should be active globally, as do 45% of New Era Enterprisers. By contrast, majorities of both Country First Conservatives (66%) and Market Skeptic Republicans (72%), who are far less financially satisfied than the other Republican groups, say the U.S. should concentrate on problems at home and pay less attention to problems overseas. The pattern is somewhat similar in opinions about U.S. involvement in the global economy. Overall, 65% of Americans see U.S. global economic involvement as a good thing because “it provides the U.S. with new markets and opportunities for growth.” Fewer (29%) say it is a bad thing because it lowers wages and costs jobs. Among GOP-leaning groups, Country First Conservatives and Market Skeptic Republicans are the most skeptical of global economic engagement, while Core Conservatives and New Era Enterprisers are much more positive. Disaffected Democrats and Devout and Diverse view U.S. global engagement more negatively than do Solid Liberals and Opportunity Democrats. This is an issue on which Solid Liberals and Core Conservatives have rare common ground. Majorities of both groups (85%of Solid Liberals, 68% of Core Conservatives) express positive views of U.S. involvement in the global economy. 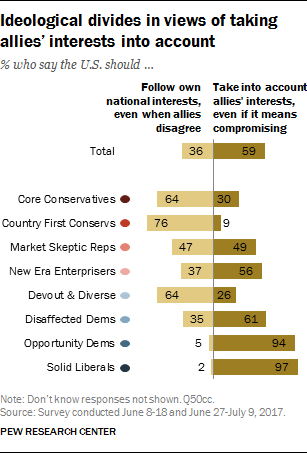 Reflecting their name, Country First Conservatives are most likely to say the U.S. should follow its own interests, even when allies disagree (76%). A majority of Core Conservatives (64%) share this view. However, Market Skeptic Republicans and New Era Enterprisers are more divided in views of dealing with U.S. allies. On the left, nearly all Solid Liberals (97%) and Opportunity Democrats (94%) say the U.S. should take into account allies’ interests, even if it means compromising. A smaller majority of Disaffected Democrats (61%) say the same. But among Devout and Diverse, just 26% favor taking allies’ interests into account, while more than twice as many (64%) say the U.S. should follow its own national interests, even when allies disagree. Overall, about half of the public (51%) thinks Americans need to “sacrifice some privacy and freedoms in order to be safe from terrorism”; about as many (46%) think Americans do not need to do this. Solid Liberals stand out from all other typology groups on this question: They are the only typology group in which a majority (58%) says Americans do not need to sacrifice privacy for safety from terrorism; 40% say Americans need to sacrifice some privacy and freedoms to be safe. By contrast, Opportunity Democrats, Disaffected Democrats and Devout and Diverse are split in their opinions. Among Republican-leaning typology groups, majorities of Country First Conservatives (55%), Market Skeptic Republicans (56%) and New Era Enterprisers (62%) think Americans need to sacrifice some privacy in the interest of safety from terrorism. However, Core Conservatives are divided. As many of them say Americans need to sacrifice some civil liberties to be safe from terrorism as say they do not (48% each).